The name of the author is engraved on the arctic polar ring with the date and place of manufacture: Dominicus Lusverg F. Romae 1744. In relief on the black wood base is the coat-of-arms of Pope Benedict XIV, who donated it to the Institute of Science. The zodiac is elegantly engraved with all the zodiacal signs and a graduated scale, and on the horizon are the names of the main winds. In the 1843 inventory we read that "to this sphere was added a brass semiaxis to which can be screwed some brass wire arms that carry at their ends the planets, whence to represent the Copernican system". The previous inventories of 1746 and 1799 do not mention the model of the world represented in the sphere. "Of this addition, which might date from the beginning of the XIXth century - as Tabarroni points out (1954, op.cit.) 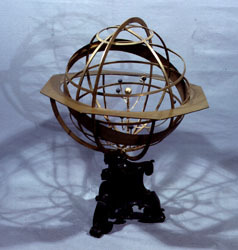 and as is suggested by the different workmanship and gilding - when the Specola became part of the central Administration of the Department of Reno (from 1799 to the fall of the Napoleonic reign), only the brass semiaxis remains with a small sphere at the end which must have represented the Sun (unless this part was not left over from an early Ptolemaic planetarium)." This semiaxis was restored in 1993, reconstructing the brass arms with the planets that represented the Copernican system (S. Ciattaglia, Bologna). At the "Conti Gentili" high-school in Alatri there is an armillary sphere, smaller than ours, signed by Giacomo Lusverg in Rome in 1669, also without any planetary system inside. G. L'E. Turner (1991), p. 68.